The United States had 341.1 trillion cubic feet (Tcf) of natural gas proved reserves as of the end of 2016, an increase of 5% from 2015, according to EIA’s recently released U.S. Crude Oil and Natural Gas Proved Reserves report. U.S. crude oil and lease condensate proved reserves remained virtually unchanged from their 2015 level, at 35.2 billion barrels. Proved reserves are those volumes of oil and natural gas that geological and engineering data demonstrate with reasonable certainty to be recoverable in future years from known reservoirs under existing economic and operating conditions. Changes in proved reserves from year to year reflect new discoveries, either in new fields, new reservoirs in old fields, or extensions of existing reservoirs; net revisions and other adjustments to previous reserve estimates; and reductions from annual production of each fuel. Pennsylvania had the largest net increase in natural gas proved reserves of all states between 2015 and 2016, adding 6.1 Tcf of natural gas proved reserves in the Marcellus Shale play in the Appalachian Basin. Following a record high set in 2015, U.S. production of natural gas decreased 1% between 2015 and 2016—the first annual decline in U.S. natural gas production in 10 years. 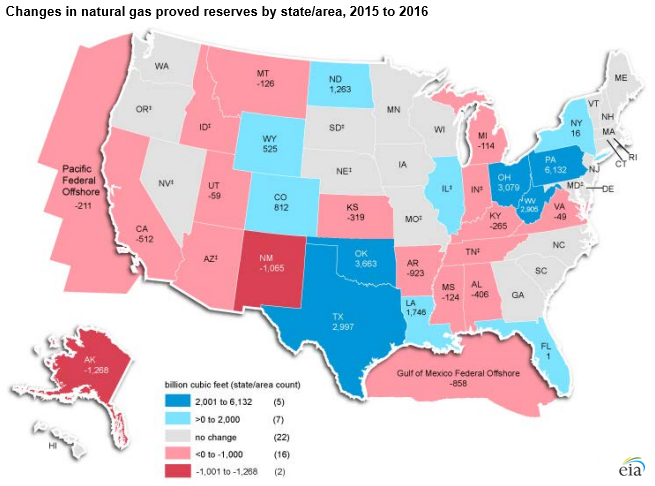 The share of natural gas proved reserves from shale compared with total natural gas increased from 54% to 62% in 2016 because gas reserves were added in several shales, including the Wolfcamp, Marcellus, Eagle Ford, Utica, Woodford, and Haynesville shales. 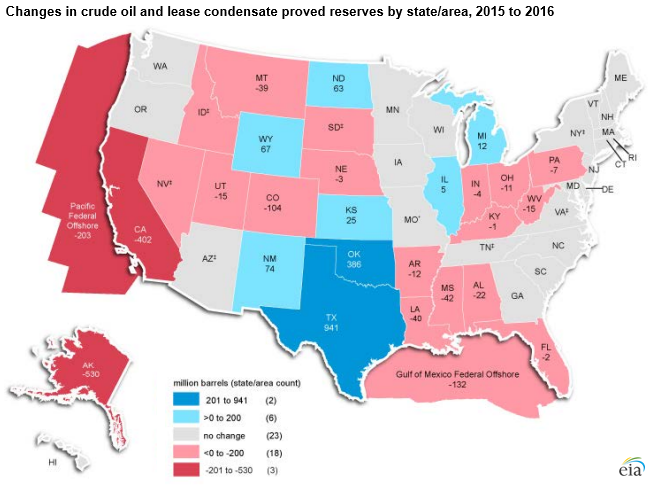 Texas had the largest net increase in proved reserves of crude oil and lease condensate of all states between 2015 and 2016, adding 941 million barrels of proved crude oil and lease condensate reserves, mostly from development in the Permian Basin. Operators drilled and completed long horizontal wells into the stacked oil-bearing formations of the Spraberry Trend and the Wolfcamp Shale. Between 2015 and 2016, U.S. production of crude oil and lease condensate decreased by 6%. More information about changes in proved reserves of natural gas, crude oil, and lease condensate is available in EIA’s U.S. Crude Oil and Natural Gas Proved Reserves, Year-end 2016 report. Note: Click for larger versions of the natural gas and crude oil maps.